The Applied Comfort K PTAC is a complete replacement for the McQuay K, EK, MEK, and PKES model. Taking in to careful consideration what would be best for the customer, Applied Comfort has created a unit that incorporates all three sections to fit into the sleeve. The result is improved performance and significantly lower cost. 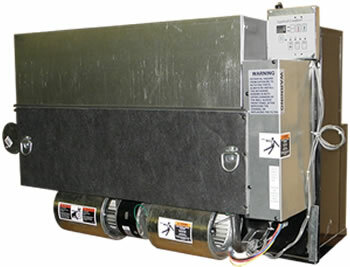 The New Applied Comfort K PTAC is a complete replacement of the 3 piece K. The new design allows the customer to replace the entire unit for about the cost of a replacement cooling section from McQuay. Applied Comfort also took the time to improve the performance of the K over the McQuay PKES by a significant margin. Improvements were made both in overall cooling capacity and EER. Remove old heat section and replace with Applied Comfort air collar or hydronic air collar. The collars install using the attachements of the original equipment. Remove the old controls and install the applied comfort controls. The Applied Comfort control box uses the same mounting holes as the original equipment.